Last week I celebrated the marketing genius of Diet Coke executives who came up with the 11:01 meal to help sell more of their chemical laden soft drinks. 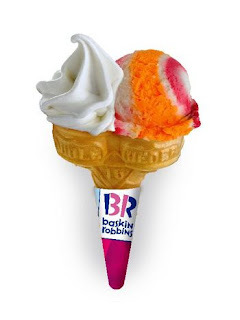 Thinking they could not possibly be outdone in inane innovation, the folks at Baskin-Robbins have put them to shame: an ice cream cone that has two cavities so you don't have to make that difficult decision between soft serve and hard ice cream. The press release clearly describes the Double Header as meant to house a duo of soft and hard ice cream but I think these marketers are selling this product short. What about two different soft flavors? Or two different hard flavors? Or one ice cream and one meatball? Maybe those marketing blitzes are still to come in a carefully plotted roll-out. Certainly times are tough and selling more is harder than ever, but this Siamese cone contraption is not only silly, it's unappetizing. Perhaps they have chosen rainbow sherbert and vanilla soft serve in the beauty shot for the color contrast, but who wants to wash down their refreshing sherbert with a creamy soft serve or their creamy soft serve with a tart sherbert? And what right-minded individual would go back and forth between these juxtaposed flavors? Basin-Robbins marketing team, I know you mean well, but if I see a turkey-flavored ice cream in honor of Thanksgiving next month I'm taking the gloves off, especially if it's featured in a double cone with gravy soft serve. it's hard enough to eat a regular cone without everything crumbling like it was the Colossus of Rhodes (too soon?). there's no way you can eat that thing. the support structure isn't there, man! We all laugh now, but I'll be the meatball sundae cone would be a big hit at the state fair circuit. This is no new innovation. The folks at Mr. Softee have been doing this for years. I find it to be quite useful, particularly with softserve- allowing one cone of each flavor. Ever wonder why other flavors of softserve are so rare? How Well Does Saveur Know You?